Kinugawa Onsen is a hot spring town in Nikko, Tochigi. With many tourist attractions like World Heritage Site Nikko Toshogu Shrine, Nikko Edomura, and Tobu World Square nearby, it has become a highly popular onsen resort. Kinugawa Onsen is a hot spring at the upper stream of the Kinugawa river, which runs through Nikko, Tochigi. There are numerous open-air baths and foot baths available, where visitors can enjoy a view of the river and the gorge. Another appeal of the Kinugawa area is its rich natural surroundings. You will be able to enjoy sakura cherry blossoms in the spring, fresh verdure in the summer, and autumn leaves in the fall. 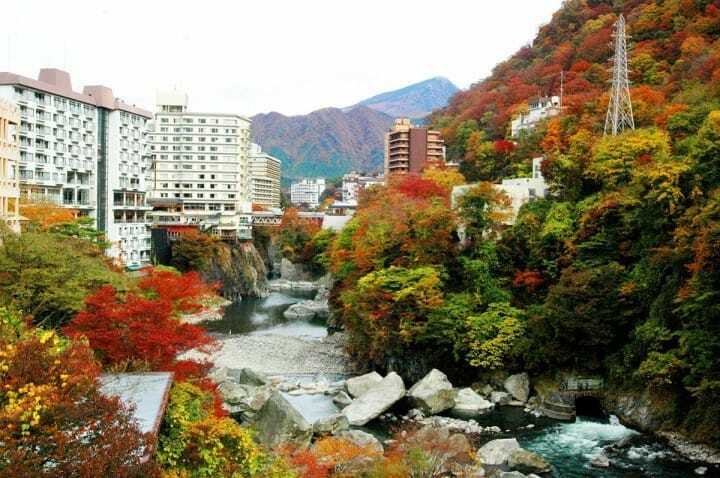 Around the onsen you will find other beautiful sites such as the Seiryukyo and Shiryugabuchi. The World Heritage Site Nikko Toshogu Shrine, as well as the popular Nikko Edomura and Tobu World Square are also easily accessible by bus. You can enjoy a world-renowned tourist attraction during the day and come back to relax in a hot spring at night. Kinugawa Onsen has an alkaline simple spring quality. It is colorless and transparent, low stimulus to the skin, and is safe for children and the elderly as well. Also, alkaline simple spring water is said to relieve tiredness and stress, so it should be a great spot to refresh your tired body. From the Tokyo area, you can board the Tobu Railway SPACIA from Asakusa Station to reach Kinugawa Onsen without any train transfers. The Tobu Railway SPACIA is the nickname of a limited express train that connects Tokyo with the Nikko and Kinugawa region. There are two types: the Kegon which arrives at and departs from Nikko Station, and the Kinu which arrives at and departs from Kinugawa-Onsen Station. From Asakusa Station, you should use the Kinu and get off at the final station: Kinugawa-Onsen. The ride is 2 hours long and will cost 2890 yen. To reach Asakusa Station from Ueno Station, check out Going from Ueno to Asakusa by Train. For more on the SPACIA and how to reach Nikko, read How To Travel From Asakusa To Nikko. If you plan on heading to Kinugawa Onsen after checking out Nikko Toshogu Shrine, Nikko Edomura, or Tobu World Square, you can use the Nikko Kinugawa EXPRESS Bus (Japanese). The bus will take you to Kinugawa Onsen without any transfers. The fare is 1000 yen for adults and 500 yen for children. Reservations are required but you can reserve and buy tickets at Tobu Nikko Station or the tourist center at Kinugawa-Onsen Station. We recommend getting your tickets before heading off to sight-see. At the following facilities, visitors can enjoy onsen hot springs without staying the night. A municipal onsen located in Kinugawa Koen park. There are open-air baths for men and women respectively, as well as indoor baths. The spring quality is alkaline simple spring, and is unique for being good for the skin. Kinuko-no-Yu is a foot bath that visitors can enjoy while admiring the Kinugawa stream. It's located on the right bank of Kuroganebashi bridge over the Kinugawa river. The spot is perfect for relaxing after strolling around the area. A facility where you can enjoy an open-air bath overlooking the Kinugawa river. The open-air bath and indoor baths both have men's and women's baths respectively. Yukemuri no Sato Kashiwaya is perfect for hot spring lovers. There are three baths each for the men's and women's baths respectively. On top of that there are two reserved open-air baths, as well as a foot bath and sauna. The beautiful Kinugawa landscape can be seen from the baths. Some of the guest rooms have an open-air bath. This is a large hotel located along the shore of the Kinugawa river. The facility has over 20 baths and saunas. You will be able to enjoy various onsens within the hotel. All guest rooms are Japanese-Western style rooms, with a bed inside a tatami room. Some rooms have an open-air bath. A long-established ryokan with a history of over 130 years, it operates as a hotel at present. Onsen water is supplied to all guest rooms, which is a rare treat, even in an onsen town like Kinugawa. There is also a large public bath. The "Kuchu Teien Roten Buro" (Floating Garden Open-Air Bath) is popular for its open atmosphere and view of the river and sky. A buffet-style dinner offers 100 different Western and Japanese dishes. Some guest rooms have an open-air bath attached as well. At Kinugawa Onsen, yuzu bath events are held on the day of toji (*1). Yuzu, a type of citrus fruit, are placed in the baths and also handed out in front of the train station. Yuzu baths are traditionally known to ward of evil, but actually the vitamin C and citral inside the yuzu have relaxation and cold-preventing effects. If you're visiting Kinugawa on toji, you should try experiencing the yuzu baths. *1: Toji: The winter solistice; the day with the shortest daylight time of the year. The Japanese have a custom of bathing in yuzu baths and eating squash on this day. There are various other events, such as the Kinugawa Onsen Oni Matsuri (Japanese) during Setsubun, the Kinugawa Onsen Sakura Matsuri (Japanese) in the spring, and the Onsen Natsumatsuri (Japanese) in the summer. You will be able to make even more pleasant memories if you visit on the day of a festival. For information on how to properly bathe in an onsen, see: What You Should Know About Bath Culture In Japan. If you want to learn more about the surrounding area, check out the following articles as well.